Ever thought there must be a simpler solution to some of those kitchen dilemmas, like getting stubborn egg shells out of your cooking? Look no further. 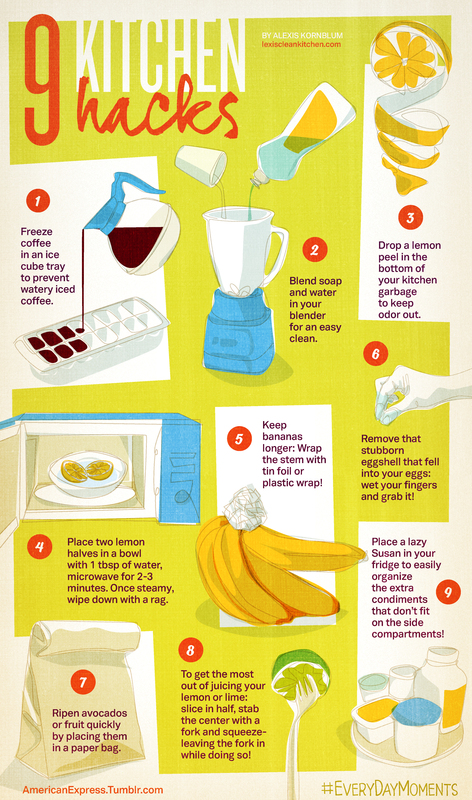 Here’s a useful infographic from Lexi's Clean Kitchen packed with great kitchen hacks to turn to when you think there must be a better way, you just didn't know it yet. There’s 9 different kitchen hacks to try out, from cleaning tips to managing your fruit better as well as couple of not so well known tricks. Did you know using wet fingers are the solution to getting hold of those rogue egg shells? There’s a well known tip for ripening avocados, how to keep your bananas for longer with some strategically placed aluminium foil a great tip for using up the filter coffee excess on a Sunday morning as well as a couple of suggestions on how to get citrusy clean freshness around the kitchen using lemons.